The minute I walked into House of Dog I fell in love with the decor. Old Coke and brand propaganda all over the walls and tables in a dimly lit environment, my kinda place. House of Dog is a Kosher hot dog joint which means in Burger Beast terms, you’re not getting any cheese on your dog. There is no dairy on meat action unless the item in question is parve (neutral aka non-dairy or meat). 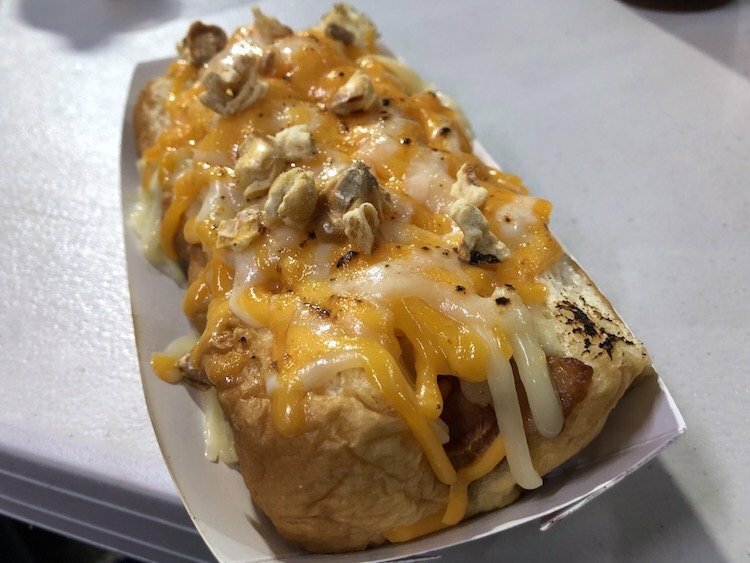 The life of a hot dog at House of Dog is not the norm. The cylindrical meats are injected with beer (Pabst Blue Ribbon) and then boiled in a beer bath. When you place your order they also get a grilling on their flat top to give it a crispy exterior. The menu is filled with great sounding dogs like Dracula (Chipotle Dog with Hot Sauce, Sauteed Onions & Peppers, Sauerkraut and Sour Cream (of the parve variety) or Clint Eastwood (2 Dogs wrapped in a Flour Tortilla Burrito style with Lettuce, Tomato, Chili, Guacamole and Sweet Chili Sauce). I opted for a Chili Dog and a Ninja Dog. The nice warm and tasty buns complimented the dogs well and did not disintegrate under the all the weight it was carrying. The chili while touted as “the best chili ever” falls into the pretty good category but it was more like ground beef and veggies sans the spices than chili. The Ninja Dog with its Mushrooms, Pineapple, Teriyaki Sauce and Wasabi Mayo silently worked over my taste buds. I’m a fan and this will definitely be on the order list next time I’m back. The “Belgian Fries” are those pre-seasoned potato wedges. While I don’t care for those type of fries, the option to buy some dipping sauces (20 are available) is great for those drunken nights. As for their burger, well there’s a reason this is a hot dog joint. I’ll be back for their Clint Eastwood…..too bad there’s no Terminator dog, it would have made me seem much more clever.